We are so excited about this new release and can’t wait to see all the upcoming projects made with these papers, we are convinced they will all be amazing! And of course we want to share this excitment with all of you out there, and we thought the best way of doing so is to offer you the chance to win these brand new papers. 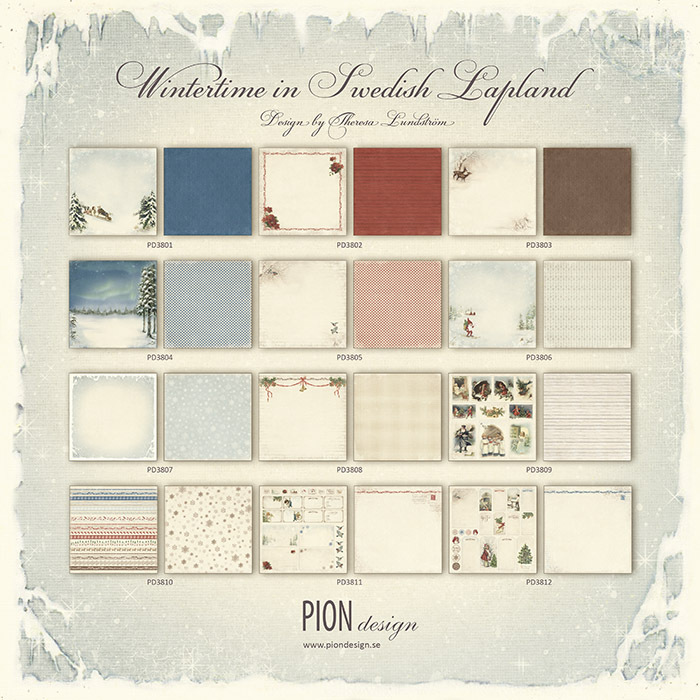 All you have to do to have a chance to receive a complete collection of Wintertime in Swedish Lapland, in 12×12″ and 6×6″, is to leave a comment on this blog post, telling us your favorite thing about winter. Share this giveaway in your own blog, and leave an additional comment below where you link to your post. Subscribe to our blog by registering your e-mail adress to the left of this page, and leave an additional comment below telling us you have done so. If you already are a follower you can say so in your comment and this of course will count as an entry. Like Pion Design on Facebook, leave a comment and share this giveaway. Become a Pion Design follower on Pinterest and pin Wintertime in Swedish Lapland. This giveaway is open for entries until Monday August 12. We will randomly choose a couple of winners from our blog, Facebook and Pinterest and the lucky winners will be announced on Tuesday August 13. Lekre papirer! De vil jeg så gjerne vinne 🙂 Det beste jeg vet med vinteren er de lange mørke kveldene hvor jeg kan med god samvittighet tilbringe tiden på hobbyrommet mitt med å lage kort:-) 1. Jeg har fortalt om giveawayen på min egen blog. 2. Jeg har registrert epost adressen min her på denne bloggen. oh,my! I adore Pion Design beautiful and cute papers! And this cristmas collection will be my favorite! Of course, in the winter I love Christmas day – warm, soulful family holiday, then I adore sparkling joyful New Year. I think they would be perfect with my lovely Tildas. The thing I like the most about the winter is snow and holiday spirit. I can’t wait to decorate out house again and have a warm christmas with our baby girl and our family. Thank you for the chance to win this amazing set of papers. Gorgeous papers! Though my country doesn’t snow before, I still wish I can build humongous snowmans in the snow together with my family and friends. I can also create and design the snowman in my own way just like using Pion Design papers in my projects. Well, I was lucky enough to be one of the winners of your last giveaway so feel a bit greedy to enter again, but I do absolutely adore these new papers also and wanted to tell you so. I Absolutely love this new collection of Pion papers, what a stunning set. I already receive emails from you, I follow you on Pinterest and Facebook and have put you on my blog today. I come by here daily to see the wonderful design team work. I really love your blog it really is so pretty, and of course you papers are gorgeous. I live in South Africa so as you know we do not have a very cold winter, cold to us though, but compared to you people nothing. 1. what an amazingly generous giveaway.thank you for the opportunity. 2. I have shared the post on my facebook page. 3. I have liked and shared your facebook page. Thannk you very much for this beautiful giveaway. This new papers collection is wonderful as the others. Love subjects, colors and feel of is stunning collection. Winter is a magic season. Here in my country we have snow, ice and fog gives to the landscape a something magical and muffled. Oh my god, this is soooooo gorgeous. I always say, now it can´t get any better, but it still does. My favorit thing about winter, is to take a walk on a clear frosty night and hear the silence and yet see everything clear, because the snow is lighting weverything up, and all you hear is your own footsteps, when you walk in the snow, that is so awesome and give a real peace in mind. Зимой самое лучшее это быть дома, в тепле, пить горячий чай с лимоном после долгой зимней прогулки. Люблю смотреть как падают снежинки и тихие снежные вечера. Amazing collection!! What a great giveaway!! I just liked and shared it on Facebook! The thing I love the most on winter is sitting with my family around the fireplace with some good wine in our glasses! I am loving these wintry designs, have liked and shared on my F/B page and am a follower both of the blog and on Pinterest …..The things I love most about winter is going for long walks in the snow(when we get any!) with my fur baby, then coming to a lovely warm drink in front of a glowing fire!. That’s my idea of Heaven!…. Zojuist ben ik volger bij jullie geworden, via via kwam ik op jullie blog, doordat iemand jullie site promootte. Ik maak sinds maart kaarten en telkens ontdek ik weer nieuwe merken scrappapier, technieken en niet te vergeten inspiratieblogs. Ik doe graag mee met jullie geweldige candy, want zoveel soorten scrappapier heb ik nog niet, omdat ik nog niet zolang scrap en dan is deze candy zeker welkom hier. In de winter vind ik het heerlijk om te schaatsen of door de sneeuw te wandelen en een warme kop chocomelk met slagroom te drinken, echt Hollands 😉 Natuurlijk is het mooiste voor een kaartenmaakster om op de donkere winteravonden lekker te knutselen en nieuwe kaarten te maken bij de warme haard. Ik zal jullie candy ook op facebook delen, ben al volger via de mail geworden en natuurlijk krijgt deze candy een mooi plekje op m’n blog! Hele fijne dag nog verder! I just became follower with you, via via I came to your blog, because someone promoted your site. Since March I make cards and every time I discover new brands scrap paper, techniques, not to mention inspiration blogs. I like to join your great candy, because many kinds scrap paper I have not, because I do not scrapbook so long and then this candy certainly welcome here. In the winter i love to skate or by walking the snow and a hot cup of chocolate with whipped cream to drink real Dutch;) Of course it is most beautiful for a card maker to craft on the dark winter evenings and make for new cards the warm fireplace. I will also share candy on facebook, am become a follower through the mail and of course get this candy a nice spot on my blog! I love, I love, I love Pion Design and all the amazing realization from your DT every day !!! I’ve shared on my FB page. we would make hot chocolate and do puzzles all day long! Lovely new Winter Collection. My favorite thing about Winter is the first fresh snow and Christmas. what a wonderful new Winter Collection. My favorite thing about Winter is the first fresh snow and Christmas. Vilken underbar kollektion. Det får en att börja längta till julen och vintern. Det absolut bästa med vintern är julen för mig. Allt pyntande och pysslande och alla tända ljus. Wauw, wat een schitterende serie hebben jullie weer ontworpen!!! Elke keer is het weer een verrassing als er een nieuwe serie uit is. Super dat er ook weer een kerstserie komt. Heerlijk om nu al met kerstkaarten aan de slag te kunnen om de stress aan het eind van het jaar tegen te gaan. Ik zou het geweldig leuk vinden om deze serie kerstpapier te winnen. Living in Texas, U.S., we rarely have snow, but the spirit of winter and especially of Christmas is here. Winter is a delightful respite from the long hot summers we endure and I eagerly await it year after year. Og dere har gjort det igjen ser jeg…. Min favoritt vinter er -15 grader, masse snø, og knirking under skoa når du går på tur..
Ellers så er det deilig å tenne masse stearinlys i mørketiden…..
Beautiful papers for Christmas time which is the most special time of they year for me. I love the crisp winter days and yes I even love the snow. It’s such a magical season. Thank you for the chance to win. Wow, I adore how these look, and I hope and pray to be lucky on your give away. Made a blog about it: http://litakins.blogspot.no/2013/08/pion-design-giveaway.html, and subscribed to this page. Vilka ljuvligt vackra härligt juliga papper!! Dem vill man ju gärna vinna… 🙂 Jag är redan följare av er blogg, ska gilla både på Fejjan, pinna på Pinterest och lägga till i min blogg, samt hålla alla tummar! Now I’ve added a link to my blog, pinned on Pinterest, shared on facebook… What I love about winter is Christmas preparations, Christmas itself and the days between Christmas and New Year, when all is (hopefully) calm and quiet. I am a faithful follower of your newsletter, because I love your papers very much. They are so wonderful(the colors, images) all vintage. My favourite thing about Winter is: making your home cosy and “close the (cold) world outside”. Lit the candles and making Christmascards and Christmaspresents for the family. I really appreciate the change of winning this lovely set of papers. I liked the page on facebook and added a link on my blog, but I do not have a pinterest account…. The thing I love about the winter is seeing all the little light in the town and just look at people be a little bit happier and share beautiful moments with each other. Wintertime is een tijd van genieten van winterse kou buiten en daarna binnen genieten van warmte en gezelligheid in huis. Ik vind het heerlijk om naar buiten te gaan als het gevroren en gesneeuwd heeft. En dan lekker te gaan wandelen of te gaan schaatsen. En o wat is het daarna fijn thuiskomen in een warm huis en lekker op de bank bijkomen met een mok koffie en iets lekkers. De kaarsjes op tafel gezellig aan en als we bij gekomen zijn de kaartenmaakspullen voor de dag halen. En heerlijk winterse kaartjes maken. Ik heb de candy in mijn sidebar gemaakt en hoop dat ik een kans maak op het prachtige winterscrappapier. Otroligt vackra papper, villa ha dem alla, de känns verkligen så vackert vintriga och svenska, färgerna, mönstren och motiven är så fina! Jag har nu delat https://www.facebook.com/charlotte.albrektsson, blivit följare på Pinterest, lämnat min emailadress. Hoppas på turen att vinna! Gordgeous vintage collection! Love it! What a beautiful line of papers, I love it..It’s such a pleasure to make cards with Pion paper and I use it very much.. It looks amazing! I’ve shared your giveaway on my blog. Liked it on Facebook and Pinterest. I have also subsckribed in this blog. what is my favorite thing about winter? All the snow and snowflakes, love snowflakes. And congratulations for your DT…. The creations are so amazing!!! Quelle magnifique collection ! je n’ai pas de blog, mais je vous suis sur Facebook et Pinterest ! à oser couper vos papiers.. je les garde jalousement ! Beautiful paper ! Magnifique ! Je participe bien sûr ! Ohh – for noen lekre ark. Disse vil jeg veldig gjerne vinne ! Vinter er flott med snø på trærne, knirking når man går, barna som går på ski og lager snømann…..
Ikke ofte jeg henger meg på giveaways, men nå MÅ jeg bare!! Og som jeg pleier å si, og jeg mener det!! Elsker papirene deres!! Disse var heller ingen unntak!! Det er dere og de nydelige kolleksjonene deres, som holder meg igang!!! je joue avec vous … Mon truc préféré de Noël est toute la préparation avant Noël , décorations ,créations , petits paquets . Votre nouvelle collection est magnifique . Det bästa med vintern är att mysa med tända ljus. Winter in Australia is June, July and August, so no wonderful Christmas celebrations for us in winter, rarely even snow. superbes papiers, avec une belle Tilda en noél ce sera joli !! I now am a follower on Pinterest ! love your creations! Because you learn on top of your actually own time is simply no effort or hurry to hurry up and therefore get information done.